i Click 'view all' to instantly compare this good deal with offers on other top duvet covers queen. 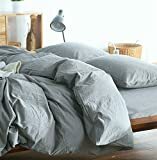 Doffapd 3pc Washed Cotton Wrinkled Soft Queen Duvet Cover Set Dark Gray is currently selling at $77.99, approximately $0.10 lower than average, giving a potential saving of $62.01 right now. With a lowest price of $77.99 and an average of $78.09 it is selling on the low end of its usual range. Price volatility is 0.59% (meaning it does not change often), so the price should stay low for a while. Right now this product is a recommended 'good deal'. The current deal is also the best price on this item over the last month. 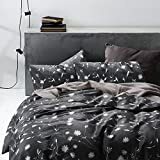 Compare the current price, savings (in dollars & percent) and Buy Ratings for the top Duvet Covers Queen that are closely related to Doffapd 3pc Washed Cotton Wrinkled Soft Queen Duvet Cover Set Dark Gray. 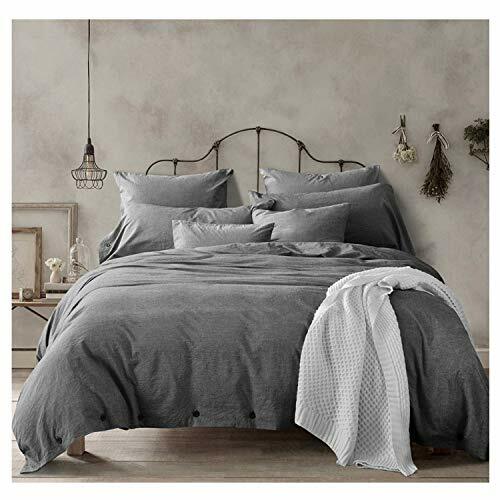 Here is how Doffapd 3pc Washed Cotton Wrinkled Soft Queen Duvet Cover Set Dark Gray compares with other leading Duvet Covers Queen. DoffapdDoffapd Brand has been enrolled in the Amazon Brand Registry.and provides high quality products at affordable price. Benefits: Duvet Cover slips over your existing duvet insert/comforter, creating luxury look of your bed. This is a beautiful duvet cover set that will brighten your bedroom. It is made of Washed cotton which is the raw material handled by special process. The cover has button closure and ties to secure the down duvet insert (not included). The set is hypoallergenic, beautiful .. You're Worth It Easy to Care for: Machine wash in Cold Water , Do Not Bleach?Tumble Dry Low If Needed , Wash Dark Colors separately If you have never experienced the luxury and elegance of high quality duvet-cover.... try it! There is a difference ! You're Worth It Features100% Washed Cotton. Washed cotton is the raw material handled by special process.It is more comfortable than other materials.Duvet cover set includes 1 Duvet Cover, 2 PillowcasesQueen:Duvet Cover 90*90" Pillowcases 26*20""Natural intentionally wrinkled "and "Original rough to touch "designed to creat a luxury look. Our product are surprisingly comfortable, breathable and Never fade. Try it! There is a difference! You're Worth It!